District Governor Gilbert Serna paid us our official Governor's visit last night and this morning. Last night, the discussions varied from Sunrise Rotary's service projects, to our involvement with the Rotaract Club, participation in the Rotary Foundation, membership growth strategies, and leadership development plans, just to name a few. This morning, DG Gilbert shared with us RI President Klinginsmith's vision for Rotary and a video on the various Rotary themes through the years. Most inspiring was Gilbert's transformation from being a member of a Rotary Club, to becoming a true Rotarian. A very inspiring story that demonstrates how we can improve our communities by improving one person's life. 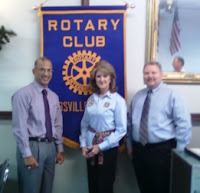 Gilbert’s involvement with Rotary began in May 1998. 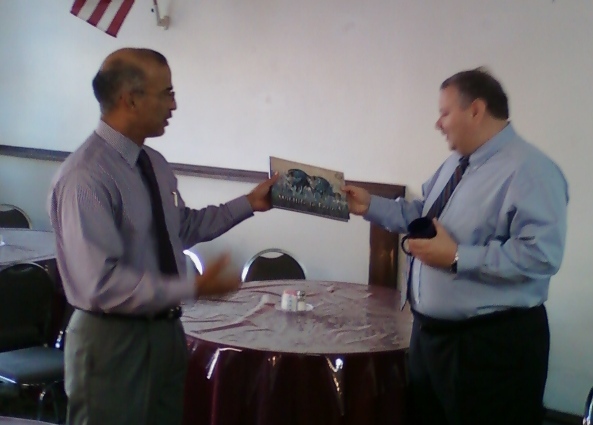 Only three years and several officer positions later, Gilbert served as President of the Laredo Gateway Rotary Club. He has participated in and coordinated a number of local and international service projects and events during this time, including RYLA, book drive for South Africa, International Night with Mexico Rotary Cubs of District 4130, ceremony in Acambaro, Guanajuato, Mexico for a matching grant for a fire truck, and numerous others. Additionally, he has helped to maintain his club’s Presidential Citation for 18 years in a row. Gilbert served as Assistant Governor for District 5930 from 2004-2007 and then as the first Lt. Governor for his district in 2007. Other community involvement includes board member of the Laredo Chamber of Commerce and board member of the Laredo Manufacturing and Logistics Association of Laredo. Gilbert earned an Electrical Engineering degree from Texas A&M University in College Station, TX. He is currently employed as Sales and Operations manager for Mercy Health Plans, a group health insurance provider. As members of the Laredo Gateway Rotary Club and Paul Harris Fellows, Gilbert and Deya participated in and chaired a Rotary Friendship exchange to and from Sweden. They have hosted a youth exchange students from Turkey and Switzerland and have also hosted professionals from Russia, also through a Rotary exchange project. Most recently, they hosted GSE team members from Chile and Spain. 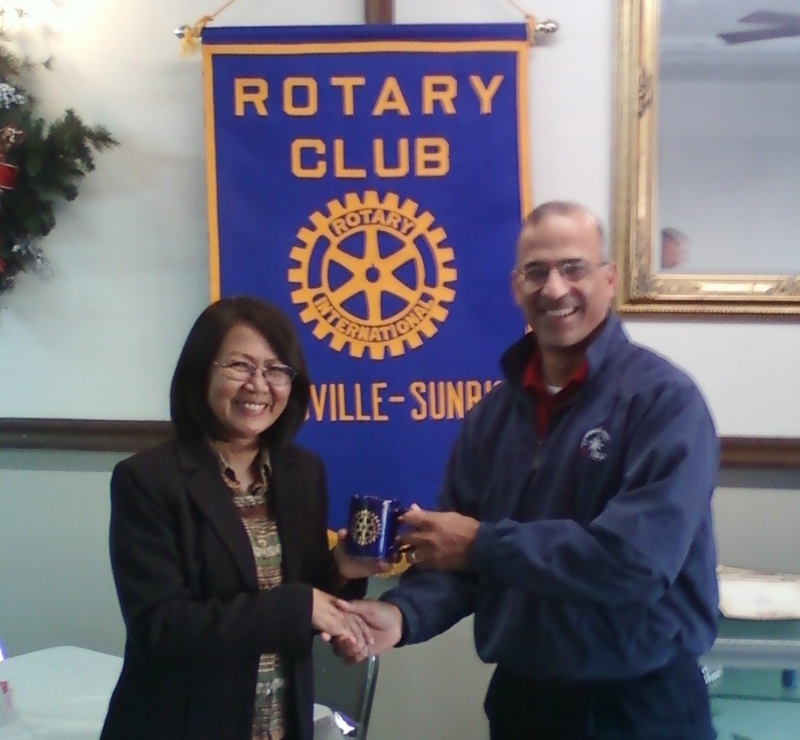 Deya is the past treasurer of the Laredo Gateway Rotary Club. She also facilitated the start of an Early Act Club sponsored by the Laredo Gateway Rotary Club. Gilbert and Deya have been married since 1990 and have been blessed with 4 wonderful children, Allyson Nichole, Daniel Allen, Andrew Douglas, and Gilbert III. Travel and new explorations are on their list of goals every year. They have visited more than a dozen states and about another dozen countries including Greece, Turkey, Italy, Sweden, Denmark, London, France and more. They are certain that traveling is good for the soul and believe that learning the varied cultures is priceless! This morning's speaker was Marilu Salazar, Director for the Center for Continuing Education and Office of International Studies and Programs. She gave us a great presentation on all of the courses available from the Center of Continuing Education. (Link to Spring 2011 Schedule) Courses are diverse, ranging the gamut from dancing (belly dancing or Salsa, Merengue and Bachata) to Financial Planning, Conversational Chinese, Spanish, French or Russian, Guitar Lessons, Drawing, Digital Photography, Web Design, Yoga, the Road Scholar program and many, many more. She also informed us about the Office of International Studies and Programs (Link to website). The mission of the Office of International Studies and Programs is to internationalize all aspects of Texas A&M Kingsville and the System Center by involving students and faculty in international studies and research globally. The office consists of four interrelated areas: international studies programs and internships, student and faculty “exchange” programs, collaborative international research opportunities and International Educational Exchange Fund (IEEF) scholarships. And best of all, scholarships are available to help offset costs to students wanting to take advantage of this outstanding opportunity. A third program is also under her direction - the Intensive English Program (Link to website). The English Language Program is designed for students, business people, and professionals to develop English proficiency in listening, speaking, reading, grammar and writing. The Program provides intensive oral and written communicative instruction and practices to facilitate a smooth transition into university academic programs at both the undergraduate and graduate levels. The University and community environment provides students with excellent opportunities to practice English language skills and to engage in multi-cultural experiences.